Summer is about corn for me. Ok, maybe okra and tomatoes too. And maybe squash and field peas, peaches, blueberries, and blackberries. There are so many wonderful foods in season during the summer it’s hard to pick a favorite. But corn is definitely right up there. I could eat it every day all summer long. The sweetness and crispy crunch of corn are irrisistible and there are so many wonderful ways to enjoy it. 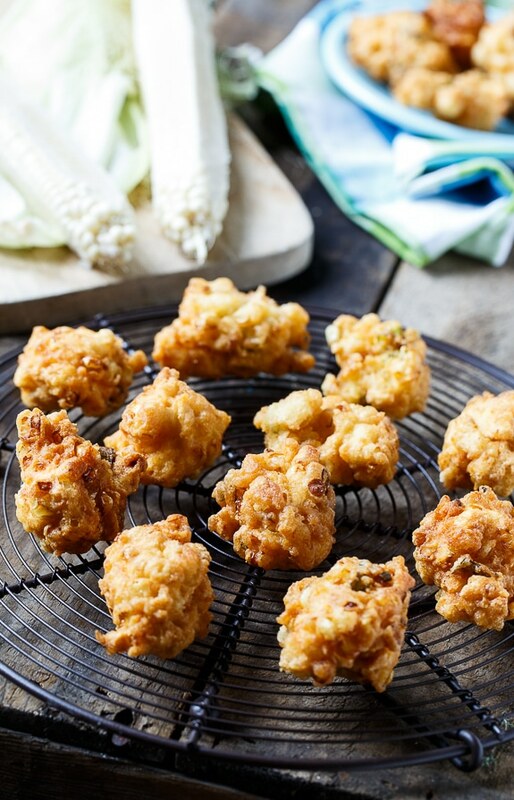 Next to corn dip, Corn Fritters may be my favorite way to enjoy corn as an appetizer. The kernels are cut from the cob and mixed into a light batter and then fried up kind of like hush puppies. 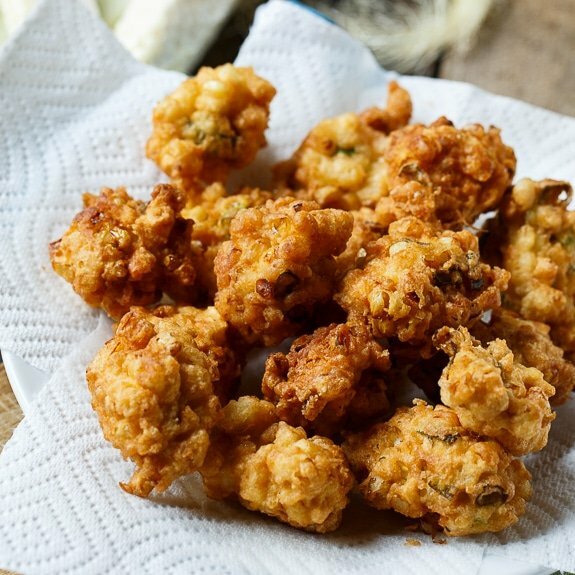 Fritters are super easy to make and only take a few ingredients which you most likely already have on hand: flour, milk, egg, baking powder, and green onion. The egg used for this recipe is separated and the egg white is whipped until stiff and then folded into the batter. The whipped egg white along with some baking powder help make the fritters light. Just a short time in some hot oil and they develop a crispy coating. I do not precook my corn kernels and these fritters don’t cook long so the kernels end up still having a little crunch to them. If you want the corn totally cooked, you will need to precook it or you can use leftover corn. 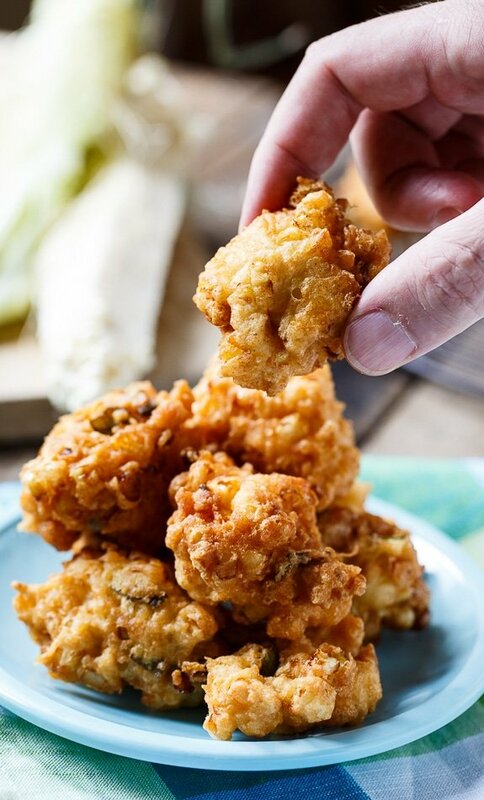 Fresh Corn Fritters are fried until golden just like hush puppies. 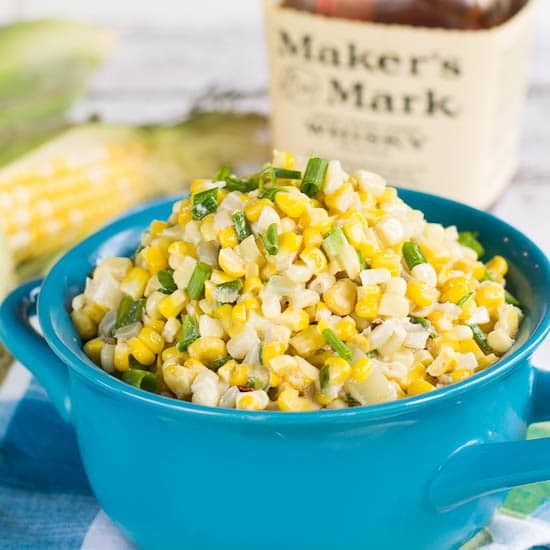 Perfect way to enjoy summer corn as a bite-sized appetizer. In a large bowl, stir together corn, green onions, egg yolk, and milk. Combine flour, baking powder, salt, and red pepper flakes in a small bowl. Stir into corn mixture. Using a rubber spatula, fold egg whites into corn mixture until evenly mixed in. Heat about 1-2 inches of Vegetable oil to 375 degrees in a cast iron pan or Dutch oven (or you can use a heavy-bottomed skillet). Drop batter by spoonfuls into hot oil and fry until golden brown, about 4 minutes, flipping over halfway through cooking time. Place on a paper towel-lined plate to drain. Serve immediately. This entry was posted in Appetizers and tagged corn, fritter, summer. Bookmark the permalink. I’ve never had corn this way but I’m so into everything deep-fried and fritters lately! Looks super tasty! I love corn fritters and there isn’t a more perfect time to make them than now with delicious sweet corn. We enjoy them at a local pub and they’re dusted with powdered sugar-so good! It’s so hard for me to choose too, summer has so many foods I love and corn is definitely on the list. 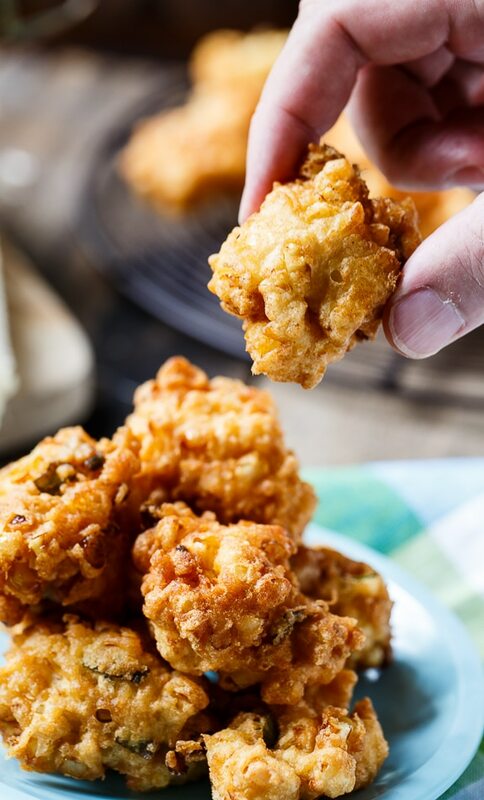 Love these corn fritters! They look amazing! 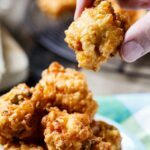 I have been wanting to make corn fritters for SO long and just haven’t gotten around to it! Definitely need to do that soon. These look so amazing! I eat corn all the time but this really looks amazing! I want to get frying right now so I can taste it. Must make this for a crowd…they would disappear in a flash. YUM!!! I’ll take a dozen! Looks amazing. Have never had corn like this in fritters 🙂 Looks yummy! Come to mama! These look so sensational! Corn fritters are my favorite! I used to order them all the time at this restaurant I would go to years ago. These sound delicious, Christin! I love corn fritters!!! I can’t wait to try this recipe!!! These look insane! 🙂 The fresh summer corn is going to have to be made into these fritters asap. Oh yum, I do NOT think I would be able to stop eating these! Basically anything fried is a win for me, and these would be no exception! Summer is definitely all about corn for me too! And watermelon and berries and tomatoes… lol These fritters sound fantastic!